SUNRISE, Fla. — The unlikeliest hero put the Islanders on the edge of advancing out of the first round of the playoffs Friday night. Alan Quine, who was in the AHL two weeks ago, blasted a shot past Roberto Luongo at 16:00 of the second overtime, a power-play goal that gave the Islanders a 2-1 win in Game 5 and a 3-2 series lead over the Florida Panthers. The Isles head home with a chance to clinch the series tomorrow at Barclays Center. Thomas Greiss made 46 saves, including a stop of a penalty shot in the first OT. The Islanders had to survive the opening 10 minutes of the first overtime as well as that rarest of events, that OT penalty shot. Calvin de Haan grabbed a puck that bounced off the end boards and threw it out of danger. His skates were in the crease, though, and the penalty shot was awarded at 7:19. Aleksander Barkov took the shot and tried a backhand that was smothered by Greiss to keep the game going, one of 11 saves Greiss made in the first OT. After the Panthers tied the score early in the third, the Islanders gathered themselves and played a smarter, steadier period than the one prior. They had the best chance to break the tie when Nick Leddy jumped into the rush for a two-on-one, but he chipped his one-timer over the net with just over five minutes to go in the third. At the start of the third, Barkov got free from John Tavares and tapped home Alex Petrovic’s cross-ice feed at 1:51. Jack Capuano challenged the goal for offside from a few seconds earlier, when Barkov entered the zone. Replays showed Vincent Trocheck’s back skate could have been off the ice as Florida crossed the blue line, but it was ruled inconclusive and the goal stood. The Islanders got to the second intermission with the lead for the first time all series, and they had Greiss to thank for that. The goaltender, who came into this series as perhaps the biggest unknown, had his best game of the five, stopping all 14 second-period shots to give him 24 saves through 40 minutes. His teammates didn’t help him much in that middle frame, turning pucks over too regularly and allowing a few odd-man rushes. Greiss denied Barkov in tight and Reilly Smith twice, once off the rush on a three-on-two, to keep it a 1-0 lead. The Islanders needed a better start to Game 5 than they had in any of the first four games, three of which they trailed before the game was five minutes old. They did get that, getting in on the forecheck early to create at least some space and breathing room outside of their own end. Steve Bernier, making his series debut in place of Ryan Strome, brought an edge to his limited minutes, most of which were played behind the Panthers’ net. Jack Capuano also needed more jump from his defensemen and got it on the opening goal 13:31 in. 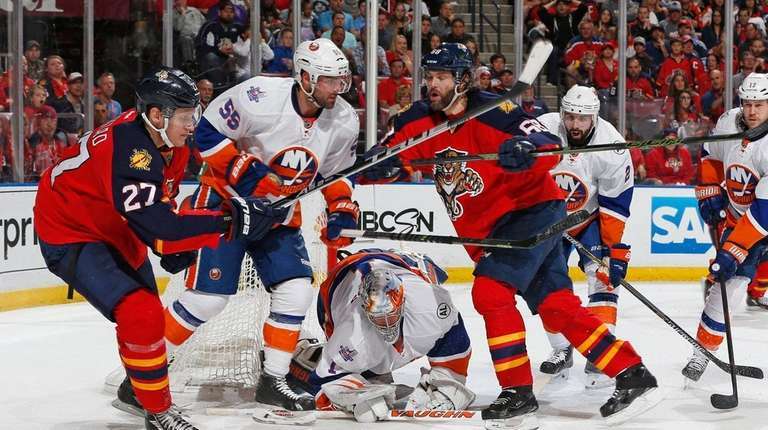 Thomas Hickey joined Frans Nielsen on a rush that seemed more like a time-killer to allow the other three Islanders to change but turned into something, thanks to their efforts and misplays by all five Panthers back in their own end. Luongo stopped Nielsen’s first shot but Hickey put a rebound back on Luongo that the goaltender kicked back out to Nielsen, who put it home for his third of the series.